Balloons is focused on cause-and-effect interactions that are designed to appeal to babies. Balloons float up the screen, and they pop when they are tapped. Babies naturally love to shake things, and when your baby shakes your device, all the balloons will pop at once! Balloons was carefully designed to be baby-proof. There are no ads, no popups, and no settings. There's nothing that requires adult intervention, and there's nothing for your child to break. Balloons will keep your baby entertained, and it won't annoy you or the people around you. Use it on a plane, in the car, or anywhere else you need to keep your baby happy. Some parents have even told us they have extra time in the shower because Balloons keeps their child occupied. And, therapists have used Balloons to help teach cause-and-effect to developmentally-challenged toddlers! We know it takes time and effort to review an app, but if you value our work, please consider leaving a positive review. It means a lot. Thank you! If you have any questions or comments, please send an email to hello@fube.ca. We usually respond quickly! We know it takes time and effort to review an app, but if you value our work, please consider leaving a positive review. Your support means a lot to us. Thank you! 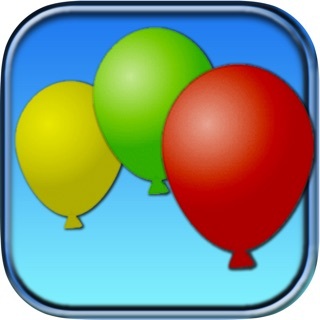 - Balloons is now free! - Other improvements and fixes. - Shake your device to pop all the balloons at once. - Fully compatible with every iOS screen size. - Minor internal updates for improved compatibility with iOS 11. - Improved graphics scaling for consistency across devices. My daughter loves popping the balloons in this app. Lovely colors. Easy to use and ideal for small children who need to work on eye-hand coordination. Thanks! This will keep your littlest grandkids occupied and quiet when they need to be seen and not heard for a few minutes. Let's face it, kids love balloons. They're so simple, and so fun! This app brings that uncomplicated pleasure to the hand screen.